Awake to rejuvenated skin with Talika Eye Dream; a night time eye mask that promotes skin regeneration at the delicate eye contour. The nourishing leave-on mask glides onto fragile skin and delivers a veil of essential moisture, hydrating the eye contour throughout the night when skin is most receptive to repair. Enriched with Bio-Peptides, the fluid solution encourages collagen synthesis, which reduces the appearance of fine lines and wrinkles around the eyes to restore a youthful appearance. A healthy dose of Soy Protein targets and reduces the appearance of dark circles by nourishing skin, whilst Vitamin F offers regeneration. 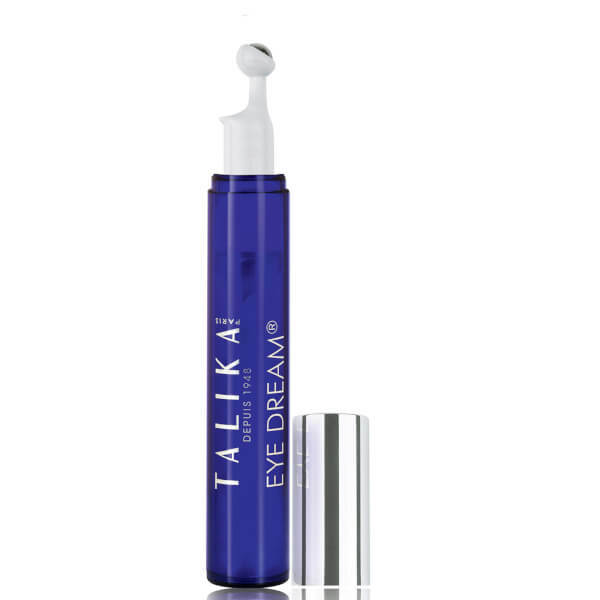 Relaxing the eye contour, Talika Eye Dream leaves skin comfortably hydrated, calm and healthy. One application every evening, on the cleansed eye contour. Before bed, simply pad the Talika Eye Dream wand underneath your eyes and over contours. Water, Tilia Cordata Linden Water, Glyceryl Polymethacrylate , Citrus Aurantium Dulcis (Orange) Flower Water, Propylene Glycol, Corn Starch, Butylene Glycol, Trilinolein, Sodium Hydroxyde, Polysorbate 20, Carbomer, Dextrin, Hydrolyzed Hibiscus Esculentus Extract, Hydrolyzed Soy Protein, "Aesculus Hippocastanum, (Horse Chestnut) Extract", Fragrance, Triolein, Tripalmitin, Phenoxyethanol, Methylparaben, Chlorphenesin, Trilinolenin, Tetrasodium Edta, Fucus Vesiculosus, Laureth-3, Tristearin, Hydroxyethylcellulose, Butylparaben, Ethylparaben, Isobutylparaben, Propylparaben, Tocopheryl Acetate, "Acetyl Dipeptide-1, Cetyl Ester", Triarachidin, Palmitoyl Oligopeptide.